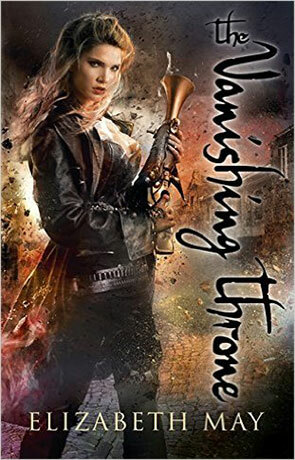 The Vanishing Throne by Elizabeth May is the second in a series of books following the adventures of Lady Aileana Kameron (or Kam) and the action follow on directly from the first book. If you haven’t read The Falconer I suggest you do, as this review definitely contains spoilers for the ending of that one. This book is not a standalone novel and relies on the reader having read the first book. So, Kam’s attempts at balancing her life as daughter of the Marquess of Douglas and Falconer (or fae hunter) have gone somewhat disastrously wrong. She has failed as a society Lady, accidently got engaged to a man she does not love, failed to figure out the man she might love, failed to kill the fae that killed her mother and accidently unleashed a horde of bloodthirsty fae (which very few human can even see) onto the unsuspecting world, while also being taken captive. I think it is fair to say she has had better days. This book is the tale of what happened next. At the start of the book, Kam is in a fae prison, taken captive Lonnrach who torturers her to gain access to her memories. Of course the more he has her memories, the more he knows what she cares about and the more he can play with her emotions. Kam has no way of knowing how long she has been in the fae realm, as time passes differently, and also know way of knowing if her family and friends are alive or if humanity even exists anymore. Her challenge is to escape the prison, then, assuming she gets free, to defend whatever remains of the world she once knew. The first book was fast paced, this has some slower, darker moment when Kam reflects on her actions, but not to the point of boring teenage moping. We see some more character development and understand a little of what has made the fae, both those who are her friends and those who are her enemy, become the way they are. The good fae are perhaps not so good and the bad fae are maybe not as responsible for the way they are as Kam first thought. Despite being presented in a fantasy setting it is a point with great empathy in our own lives. The only point that comes across as little unbelievable is Kam’s lack of reaction to the loss of her father. Even with the difficult relationship that they had, he seems to be an important figure in her life and his loss should have had some level of emotional repercussion. The second novel has less of the Victorian societal pressures of the previous one as the society has essentially broken down, leaving free for Kam to be who she is. However the interplays of power, social pressure and consent are still a theme in the writing as different characters assert their dominance over others at different times. Needless to say, the biggest downside is that it ends with you wanting more, full of questions, and probably needing to wait a while for the next one. Written on 26th February 2016 by Karen Fishwick.